It�s getting silly. Well-run junior gold mining companies are advancing their operations and meeting or exceeding expectations, and their reward? The stock goes down. Admittedly, the price of gold has slumped recently. But this is an aberration. Mine reserves for the senior gold producers are plummeting. Mine production is falling. There is substantial underinvestment in the sector because the current price for gold isn�t close to what is required to sustain the industry. The price of gold must rise. Yet current valuations for mining companies imply that women around the world are about to stop wearing (and wanting) jewelry, central banks are about to stop hoarding gold, and sophisticated investors will stop adding gold to their portfolios as the world�s premier �safe haven� asset. Absurd. This disconnect between current valuations and real-world fundamentals spells fantastic value for investors. One mining company that epitomizes the value opportunity presented to investors is Northern Vertex Mining Corp. (TSX: V.NEE, OTCQB: NHVCF, Forum). Northern Vertex has just declared full commercial production for its Moss Gold Mine, located in Arizona, USA. And the Company has made this announcement with an explanation point. According to its Feasibility Study, the Moss Mine has a projected throughput of 5,000 tonnes per day (tpd�s). However going forward the Company now believes production will be significantly higher due to exceptional performance of the crushing plant and operational team which has already established a one-day throughput record of 13,000 tonnes. For investors, it�s important to note that the Moss Mine isn�t simply a bulk production story. This is also low-cost, very efficient mining: open pit, with heap leach processing. Even in the current price environment, the Feasibility Study projects a 63% after-tax internal rate of return. This is based on gold mining (with silver credits) that is expected to yield 36,000 � 40,000 Au-equivalent ounces in 2019 (the first full year of commercial production), rising to 59,000 � 65,000 Au-equivalent ounces in 2020 (including 52,000 � 57,000 ounces Au). Grades for the Measured & Indicated resource average 0.87 g/t Au Eq, considered a robust grade for an open pit, heap leach mining operation. The current M&I resource is approximately 435,000 Au Eq. and there is also an Inferred resource of 43,000 ounces Au Eq., which represents a 10-year mine life as per the Company�s 2017 PEA. However, the Moss Mine gold deposit is open in several directions, providing abundant expansion potential and a major drilling program is expected to be underway in the near future. Despite the strong economics and despite this strong operational performance, shareholders have not been rewarded � yet. 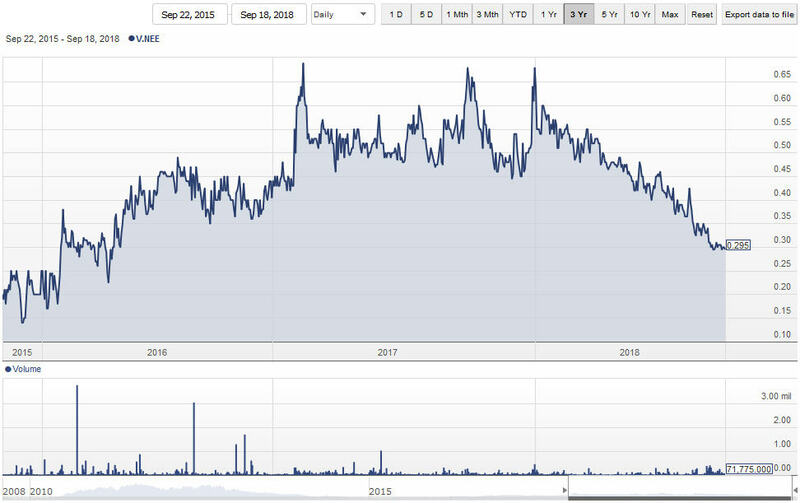 A three-year chart illustrates this disconnect between what the Company has done and the economics of the Moss Mine versus the current valuation. As experienced investors know, markets can remain �irrational� for extended periods, but not forever. Gold (and silver) was mired at an extremely depressed level during the 1990�s. What followed was a decade-long bull market run, one of the longest and strongest of the New Millennium in any market. And Northern Vertex isn�t standing still. With strong margins at its Moss Mine operations, this is a Company focused on leveraging these revenues into additional production growth. Management is committed to advancing Northern Vertex to become a mid-tier gold mining company. While valuations in the sector mean that companies are not being rewarded for adding value to operations, this is endemic across virtually the entire sector. This means that cash flow from the Moss Mine can go a long way in terms of funding the acquisition of other highly prospective gold projects. NEE boasts an award-winning exploration team (2010 Thayer Lindsay Award) that has an impressive track record for making grassroots discoveries and advancing exploration. With a strong flagship asset � now in full commercial production � and a strong team, this is a Company clearly poised to build upon its achievements to date. Investors who positioned themselves ahead of the bull market for gold from 2000 � 2011 did spectacularly well, with mining stocks substantially leveraging the gains in the price of gold itself. Market dynamics today look eerily similar to pre-2000. It�s not necessary for investors to move into higher risk early exploration stocks in order to be positioned for maximum upside gains ahead of the next bull market. Today, even producing gold mining companies with solidly profitable operations (like NEE) can be scooped up by investors at �an exploration stage� price. Northern Vertex Mining Corp. is a strong, low-risk investment option for investors looking to capitalize on this current disconnect in mining company valuations. FULL DISCLOSURE: Northern Vertex Mining Corp is a paid client of Stockhouse Publishing.